Beta-carotene is a naturally occurring colorant widely used by the food industry, being added to margarine and other products. Although a synthetic version is available, increasing consumer preference for the natural product makes extracting it from biological sources attractive. The obstacles are that the pigment occurs in highly dilute form and its extraction requires organic solvents which runs up against the preference for an entirely natural product. The cells of the brine tolerant alga Dunaliella salina contain a high concentration of Î²-carotene, but the organism only grows in dilute culture. Separation of the cells from the brine by a low cost process that exploited the unique properties of their membranes was developed in the early 1980’s between the CSIRO Division of Chemical Technology’s Biosynthetic Technology Program and a small local company. The public company Betatene Ltd was established to commercialise the technology and was sold to Cognis in 1993 which in turn was taken over by BASF in 2010 for â‚¬3.1bn. Under its new owners Betatene Ltd retains its position as the world’s major producer of Î²-carotene and related pigments all of which are manufactured in Australia. The first and second oil shocks of the 1970’s focussed attention on alternative feed stocks for liquid fuels and the replacement of petroleum based chemicals. Although by no means the first time that biomass from various sources had been suggested and used as a petroleum replacement, the oil shocks coincided with the molecular biology revolution that promised greatly increased efficiency in producing natural feedstocks and their conversion. Amongst various propositions for more effective uses of our more obvious resources, was a â€œbiosaline conceptâ€; an idea that had originated in Israel another place with desert, sunshine and brackish water. Armed with these ideas, the founding Chief of the CSIRO Division of Chemical Technology, Donald Weiss FAA, set up a Biosynthetic Technology Program that would explore the production of liquid fuels and chemicals from plant biomass. This ambitious program inevitably had to become more focussed because by the end of the decade, the OPEC cartel had lost its grip on the oil market and the falling price of oil made the biosynthetic route for liquid fuels and bulk chemicals uneconomic. Although, the inevitability of â€œpeak oilâ€ and the emerging greenhouse threat were put forward to justify supporting research in this area it was considered that market forces would take care of things in the short term while physics, ranging from photovoltaics and artificial photosynthesis to nuclear energy would take care of the long term. However, the experience gained in the early stages of the program was not entirely wasted because the skills acquired were now focussed on the higher value end of algal biotechnology. At the time, there was considerable interest both in Australia and abroad in the halotolerant alga Dunaliella salina as a source of Î²-carotene (Figure 1). Most Î²-carotene on the market was synthetic, manufactured by Roche with its production costs a tightly held secret. However, Roche was maintaining a D. salina research program at its Institute of Marine Biology in Dee Why NSW, which suggested that the biosynthetic route might have advantages. One of these advantages could be the rising consumer preference for â€œnaturalâ€ over â€œsyntheticâ€ food additives; the main market for Î²-carotene being as a colorant and pro-vitamin A. In the case of vitamin A only the natural cis-isomer is biologically active, whereas the synthetic product is an equal mixture of both isomers. Therefore, the economic analysis was expanded to become a socio-techno-economic analysis and with the help of colleagues from some other institutions a range of premiums that consumers might be prepared to pay for the natural product was estimated. This exercise showed the market to be surprisingly heterogeneous with uses ranging from margarine and drink colouring through animal feeds to Î²-carotene capsules in the health food shops. Provided with this information, it was possible to focus on the technical aspects of cultivating the alga and isolating the product to see whether the costs could be brought within a desired range. In doing this, two streams were used from the Division’s earlier efforts to study algal cultivation as a source of biomass feedstock. The first showed that open unstirred, shallow ponds offered the lowest cost per kilogram of product. Other types of more â€œefficientâ€ reactors had a negative energy balance and were only suitable for very high value products (typically, in the $100’s per gm, rather than $100’s/kg CSIRO had set for Î²-carotene). Previous attempts used by others to harvest the alga from hypersaline cultures involved filtration or centrifugation, both of which were expensive in dealing with such dilute suspensions. The answer came from earlier research that had been done into the mechanisms of halotolerance in D. salina in the hope that one day these mechanisms might be transferable to other organisms using the new tools of genetic engineering. While studying the cell membrane as the barrier between the 5M NaCl environment and the inside of the cell it was found that, unlike most cells, the alga had extensive hydrophobic areas on its surface, any charged groups on the membrane proteins being electrostatically shielded by the medium’s high ionic strength (Figure 2). This provided the basis of the low cost harvesting method that was needed. Simple adsorption to a hydrophobic surface offered an attractive, environmentally benign approach to harvesting these small (2-4 Î¼) cells. A patent was subsequently issued to CSIRO and Cockajemmy Pty Ltd, a small industrial partner who helped reduce the concept to practice. The technology and science underlying the manufacturing process has been described in general terms by Curtain, West and Schlipalius (1987) See Publications. The founder of Cockajemmy Pty Ltd, Simon West, was a serial entrepreneur and pioneer venture capitalist with experience in the food industry. Realising that the economics of the process depended on harvesting the alga from extensive open ponds, West and his co-investors obtained a lease over the saline Lake Cockajemmy, near Willaura in Victoria’s Western District to provide feedstock to a pilot plant (Figure 3). A large number of hydrophobic surfaces were experimented with to ensure that only the alga and not the clay particles and halo-bacteria present in the brine were harvested. These included silicone-treated magnetite and silanised glass columns. They all posed major materials handling problems. An obvious low cost hydrophobic contacting surface was fine air bubbles, as in mineral flotation. The extreme susceptibility of Î²-carotene to oxidation initially ruled this out. The use of an inert gas such as nitrogen was judged as too expensive. However, there was one place where a low cost supply of nitrogen and suitable brine lakes occurred together ‘ Whyalla on the Western shores of the upper Spencer Gulf in South Australia. There, BHP had a basic oxygen steel process that produced pure nitrogen as a by-product of air liquefaction and the nearby shallow lakes could be easily landscaped into culture ponds. Following negotiations with BHP and after verification of the economics of the process by an independent consultant, a public company Betatene Ltd was established with an authorised capital of $20M. 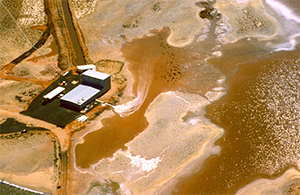 The first stage of a production plant was built at Whyalla, SA, adjacent to salt lakes that had been modified to supply the feedstock (Figures 4, 5, 6). Independently of CSIRO, Betatene continued to develop the process, to include extensive proprietary â€œknow-howâ€, particularly in the field of extracting the Î²-carotene from the algal concentrate to yield a range of marketable products. The subsequent trajectory of Betatene followed that of many other Australian innovative technology companies. The steps are early venture capital investment and collaboration with a public institution, such as a university or CSIRO, premature ASX listing, scale-up or commercialisation difficulties, then takeover by a foreign multinational with access to world markets. When the initial capital was burnt during the establishment phase Betatene was privatised by the original investors and acquired for $60M in 1993 by Cognis, the chemicals division of the consumer products conglomerate Henkel. By 1995 under its new ownership Betatene had entered the top 500 exporters list, the only CSIRO spin-off at the time to have done so. Cognis, including Betatene, was sold in 2001 to a consortium of private investors. Cognis was acquired by BASF for â‚¬3.1bn in 2010 with the objective in expanding its portfolio of products based on renewable raw materials (http://www.basf.com/group/corporate/en/news-and-media-relations/news-releases/news). Under its new owners Betatene retains its position as the world’s major producer of Î²-carotene and related pigments all of which are manufactured in Australia. The history of the company to 2000 and the lessons taught by its development are discussed by Curtain (2000). An important lesson was that whereas Betatene received approximately $350,000 in taxpayer funding, mainly through competitive grants, a commercially unsuccessful Western Australia-based project received $4.5 million. In raising $10 million of its initial capital through the ASX, private investors carried most of the risk. Depending on when they realised on their investment they enjoyed a substantial capital gain. Aerial view of Whyalla plant in operation 1987. The faint white line extending from the top left hand corner to the plant is a nitrogen pipe. Close by is the canal bringing culture from the lake. [Source:CSIRO].